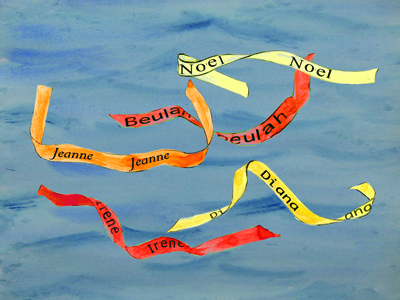 A series of three watercolors, using the names of hurricanes and tropical storms that have been so devastating that they have been removed from the list on names used to identify the procession of Atlantic storms each year. Before the end of the 19th centaury the Australian meteorologist Clement Wragge began to identify the devastating cyclones that formed in the pacific by giving them names. By 1953 the World Metrological Organisation had established a system of using of using female names to identify the hurricanes that formed over the Atlantic, adding male names to the list in 1979. There are now six lists of names that are used in rotation with each year beginning the next list. A name is ‘retired’ when a storm has been so devastating to life or property that the reappearance of that name would be insensitive and distressing. Forming deep in the Atlantic, these powerful and fickle storms are given the familiarity of first names so that we may follow their progress, their path is unpredictable their potential unknown their disposition uncertain.